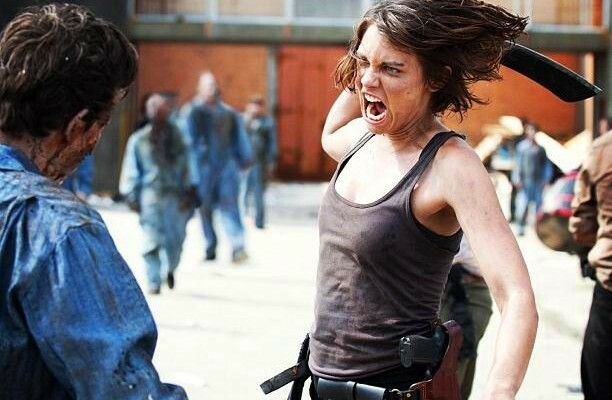 She's Fantastic: The Walking Dead's MAGGIE GREENE! Maggie comes with a big blade, a handgun, and an automatic rifle. Note the shape of the rifle strap, I make mention of it below. The knife and gun fit nicely into her holsters (which are permanently fixed to the figure). McFarlane's The Walking Dead series (both comic and television) have revolutionized the highly-articulated true-to-life figure realm. The jeans are just amazing. They have all the articulation you could want with almost invisible seams. The rifle strap is extremely confusing to me. It seems pre-molded to lay across her body in a certain way, but I can't make it look like it's not defying gravity and I was unable to find any hints online. Here are some pictures of Lauren Cohan as Maggie Greene from the AMC's The Walking Dead. 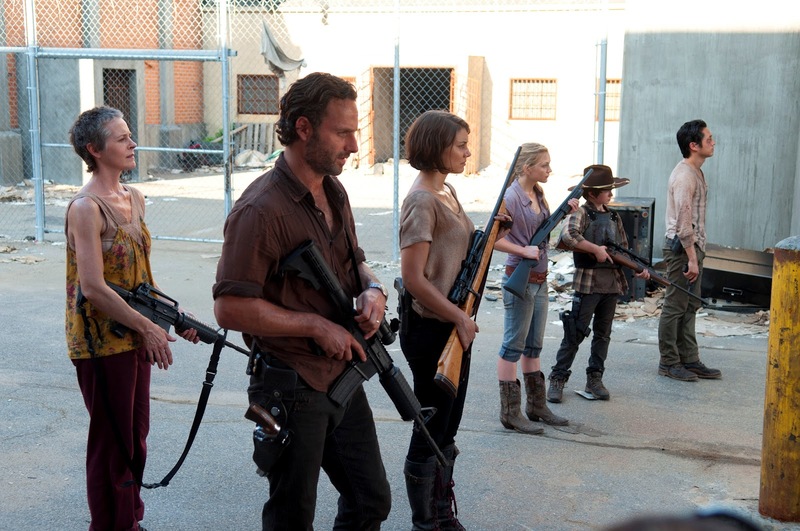 Michonne, Maggie and Andrea all look great together, but I'm noticing in the pic that their scales seen to vary a bit. I would tend to think that Maggie was taller than Michonne in real life. It's surprising to see how cool this line has become. The first wave was awful. Very little movement & action features in the Walkers. Michonne grabbed my attention when she was released & each series has become more awesome since then! Maggie isn't as good as Michonne & Andrea, but she is still a solid figure. I noticed Carol is listed for the next set which is pretty cool. Would you buy a TV version Governors Daughter if they made her? Or no Walkers at all? No I definitely can't handle any walkers in my collection haha. I did not hear about Carol - that's amazing news! Sasha will be a great character, too. Maybe even those freaky little blonde girls (they could come with little dead rats and bunnies). There's a cool comic version of Andrea coming out in June (both in a color and black & white I think). I can't wait to add her to my collection (comic version MIchonne was the first figure I bought.. way before I saw the show or read the comics). Also, did you see the images of the upcoming Carol figure?? I'm guessing she'll be out in the Fall sometime. She's my favorite character so I super excited to get her.